Ray-Ban RB3025 Aviator Review – Flight Worthy Sunglasses! I know I have said this before, but I feel it deserves repeating. You have to just love Aviators! Maybe I’m so enamored with them because I think it’s funny I used to hate them so much, yet now I can’t get enough of them. The more mirrored, the better! They remind me of the suave characters in movies, not to mention the fact they’re often worn by pilots, and pilots are awesome. I mean, come on! they fly airplanes! 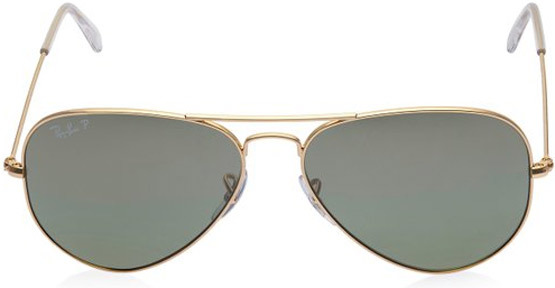 Anyway, those are just some of the things that run through my head when I see aviator sunglasses, and they’re the reason that aviators keep popping up on my list. I love them, and want them all. The Ray-Ban RB3025 Aviator Sunglasses offer both style and selection in a classic aviator shape. They have the rounded frames and lenses that come to a point on one side, and the metal frames are small without being too delicate. The thin frames are what I like most about these aviators, but they may not be the perfect glasses for those of us who have a clumsy nature. The thin frames can bend or even break if you’re not careful with them, and they are an expensive investment to have to bend back into shape all of the time. If you have long hair, you’d have to live with another aviator issue as well. The nose guards can catch on a bunch of hair if you set them on your head, and the hair sometimes stays in them (and then rips out) when you try to put them back on. I’ve had this happen with other glasses, and OUCH. That being said, if you really want a pair of these (or any classic aviator actually) just remember not to pop them on your head! There are more than 40 styles of these classic glasses, so there has to be a look for just about everyone. I don’t think I’ve ever met a person who doesn’t look great in aviators, so it’s just a matter of preference for style and color. The variety doesn’t end at just colors either. The RB3025P come in 3 different sizes, the smallest being 55 mm, midsize is 58mm and the largest is a 62 mm width. Smaller faces will probably do fine with the 55, but bigger features may need a 62 mm size. Light Enough To Fly. But Are They Too Light? The lenses on some of these are not very dark, so they won’t obscure your eyes entirely when you wear them. That’s not to say they won’t do the job to for you, it’s just worth being aware of this before you decide to hit that purchase button. You may want to go for a darker tone. I love Aviator glasses so much that these classic options are still totally in the mix. I can’t decide what color or look I would like, but I’m leaning toward an option of the includes gunmetal frames. They’re just so classic. If you’re like me and want to fly off with these sunglasses, soar on over here and pick a pair up.